Wilhelm von Bezold (1837-1907) was Professor of Meteorology in Munich as well as Director of the Prussian Meteorological Institute. His main interest as a scientist was the physics of the atmosphere and he contributed much to the theory of electrical storms. His uncle Gustav was a prominent art historian, and this may well have been instrumental in the appearance, in 1874, of his «Farbenlehre im Hinblick auf Kunst und Kunstgewerbe» in which Wilhelm von Bezold introduces a colour-system in the form of a cone. 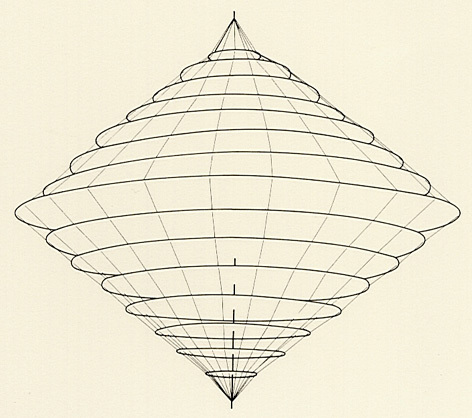 Although reminiscent of Lambert’s pyramid, this cone is conceived differently — similar, in fact, to the Chevreul’s hemisphere. Bezold’s intention was to create a colour-system directly based on perception, but he was not the first to attempt this; the painter Johann Christoph Frisch, from Berlin, is probably entitled to that honour. In 1788, Frisch had introduced an asymmetrical construction, proposing a colour-circle with eight segments which allowed for the eye’s recognition of a greater distance between blue and red and blue and yellow than between yellow and red. But Frisch’s experiment did not meet with much response, and it was another 100 years before Bezold proposed a similar work. Von Bezold’s colour-cone has white at the centre of a circle which forms its base. The colours darken towards the tip of the cone until black is reached. He derived the circle from his experience that «if the purple colours are placed between violet and red, it is in fact possible to accommodate all hues in a recirculating series. They can therefore also be distributed along a closed line, most easily around the circumference of a circle, and thus are given material form». 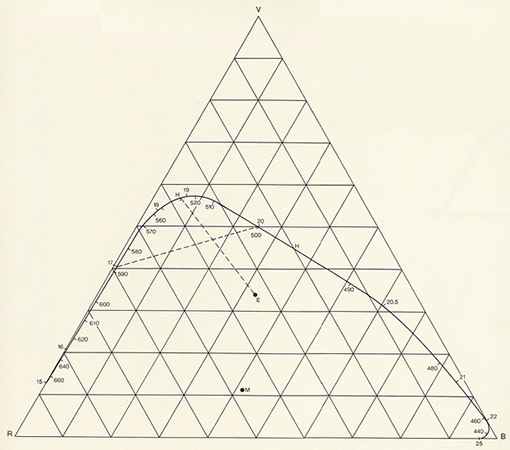 (In the second edition of Wilhelm von Bezold’s colour theory, which appeared in 1921 — almost half a century later — the publisher W. Seitz undertook some radical changes: Bezold’s cone, for example, was simply replaced with William Oswald’s double-cone, which we shall be describing later). 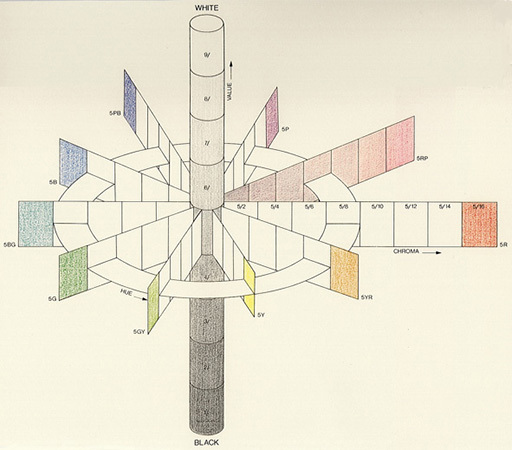 Von Bezold introduces a special colour-circle, which we show next to his cone. 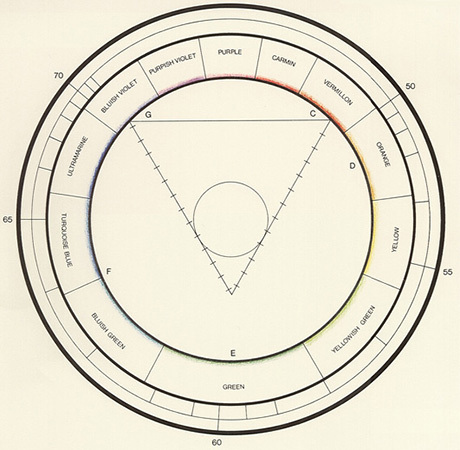 He regards this circle as a section, in fact: «a portion of the true colour-chart which approximates a triangle, in the corners of which can be found the colours red, green and blue-violet». 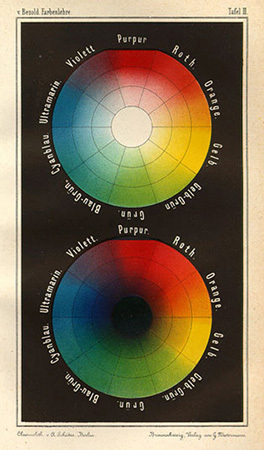 He is therefore strongly oriented towards the three primary colours of blue, green and red which Hermann von Helmholtz and James Clerck Maxwell were able to scientifically justify and popularise in their three-colour theories, leading to the selection of a triangle as the true colour-chart. In his 1874 preface, von Bezold acknowledges his two predecessors and their achievements. He reminds us that Helmholtz was the first to recognise the difference between the additive mixing of light rays and the subtractive mixing of dyes, and that we have Maxwell to thank for the laws of «true colour mixing, established with the aid of convincing experiments». It was only after their investigations that the physical and psychological aspects of the theory of colour assumed sufficient form «to be able to serve as a basis for practical, aesthetic enquiry». 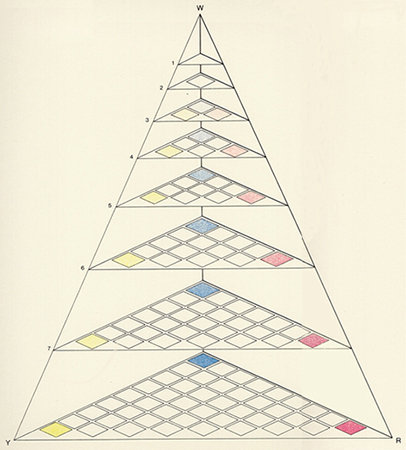 Von Bezold goes on to state that it was now time to try — and here he had his own work in mind — «to organise the theory of the formation of colour in a similar way and on a firm basis, and to place it as a companion of equal stature at the side of both other sciences» — implying anatomy and geometry, both of which are significant to art. In spite of the attention he pays to science and scientific quantification, von Bezold is primarily concerned with art and design and wishes his circle to assist painters and colourists. Even if the most exacting experiments and a sense of order suggest that «on one and the same course of the circle’s circumference an approximately equal number of barely distinguishable hues are located next to one another, the impression remains that the hue in the area of blue and green changes at a much slower rate than in the area of purple and violet». Consequently — as suggested to the left — he attempts: «to divide the circle into colour-groups in such a way that the character of the neighbouring groups appear to the eye as being of equal difference». The individual hues increasing towards green are: purple, carmine, vermillion, orange, yellow, yellowish green, green, bluish green, turquoise blue, ultramarine, bluish violet and purplish violet, with numerous «complementary colours» being placed opposite green — the largest sector. The letters placed along the inner circumference represent musical notes and are part of an attempt to refute the theory of «chromatic equivalents» which can be traced back to George Field. We shall leave both these aspects undisturbed, although von Bezold took great pains in his search for a harmony of colours. He tried to find harmonic triads through the construction of equilateral triangles around the white centre of his colour-circle. We show one triangle which links blue-violet and vermillion to green. That its tip does not reach into the green sector illustrates a basic failing of systems which imply that an integration of colorimetry into a spacial geometry is possible. 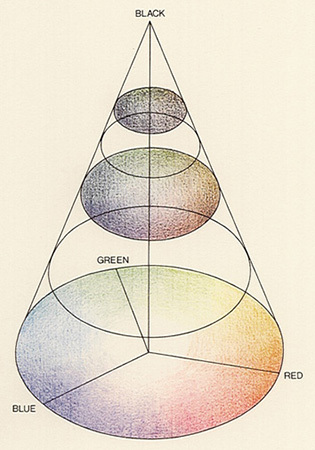 Colour-systems must be three dimensional, but it is not necessary for their structure to be graphically simple. This idea is first realised by a system which the American painter Henry Munsell proposed at the beginning of the 20th century. 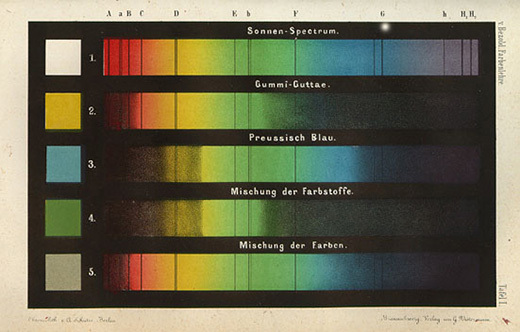 Von Bezold was indeed unable to present a comprehensive colour-system — he overemphasised the blue and violet hues — but his name is kept alive in modern perceptual physiology by the Bezold-Brücke phenomenon: he observed electrical lamps through coloured filters and noted that when seen for example through a red filter, the brightest point of the lamp was discoloured yellow, and was discoloured green when seen through a blue-green filter. The colours which we see are thus — at high values — dependent on the intensity of the light. This displacement of perception is nowadays explained by the assumption that at the point of greatest light intensity — the brightest point, therefore — those photo-electric cells in the eye which are excited to their maximum become saturated, and thus contribute relatively little to our perception of colours. In previous years, Brücke (see above) had, incidentally, attempted to formulate the psychology of colours within an aesthetic system. 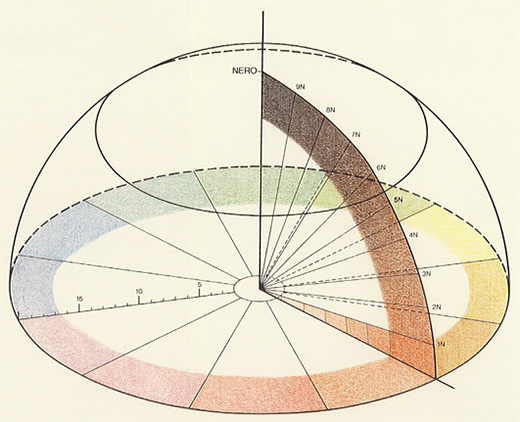 In his book, von Bezold risks a second attempt at such a formulation — to him all the more essential since Goethe’s «Theory of Colours», in his opinion, «had no lasting influence upon the development of science and had long been the object of superb disproof». A hundred years ago it was still possible to write in this way without contradiction. Meanwhile, scientists have come to understand such matters more fully. Date: By presenting his «Farbenlehre» in 1874, physicist Wilhelm von Bezold wished to establish a new branch of science. 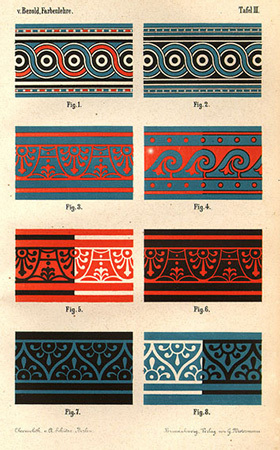 Bibliography: W. von Bezold, «Die Farbenlehre in Hinblick auf Kunst und Kunstgewerbe», Braunschweig 1874 (The 2nd 1912 edition was heavily revised by W. Seitz) (illustration I; illustration II; illustration III). W. von Bezold, «Über das Gesetz der Farbenmischung und die physiologischen Grundfarben», Annalen der Physiologischen Chemie 226, pp. 221 – 247 (1873).